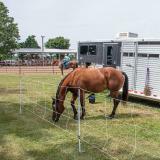 Horse QuickFence is a "ready-to-go" roll of netting with posts built into the electrifiable, plastic mesh. Quick and simple to install. 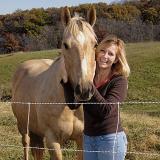 Visible to horses, deer, other livestock and humans, which makes it very effective. 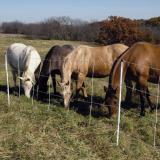 Use as a portable fence when camping or creating semi-permanent or temporary pastures. Can be used for cattle, llamas and will stop most deer. Horizontal Spacings 12", 12", 12"
Each roll comes with 1 Warning Sign and 1 Repair Kit. No tools or special skills needed to install. Plastic verticals provide extra visibility and are also uniquely designed to break if an animal gets its head or leg entangled. No extra gates needed. Just turn off the energizer and pull the first post to create an opening. #208022 - $1.30 per ft (100' roll with double spike posts). #208021 - $1.62 per ft (50' roll with double spike posts). See PDFs and videos above for additional installation instructions. If the voltage drops below 3000V on the net, you need to turn off the energizer and unhook the net from the energizer. Test the energizer by itself. If the voltage is 5000V or higher on the energizer, the problem is in the net. The most common problem is that the lowest “hot” strand has been caught around one of the metal spikes on the posts and is shorting it out. The net must be at least 2" away from anything metal (metal posts, existing fences, spikes on support posts). With proper care, netting should last 5-7 years. Replacements will be prorated. Listed below are recommended optional components. Your particular situation may require alternative recommendations. Please call and talk to our fence consultants if there are any questions at 800-282-6631. 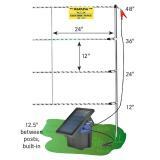 A 110v wide-impedance electric fence energizer used for medium length fences. Safe to use with all polywire, polyrope, tape and electrified netting. 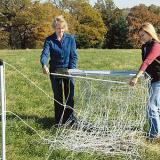 Thick temporary posts for electric fences. Useful corner support on low-tension fences. Easy access in/out of net enclosures without having to turn off the energizer! A replacement clip for the bottom of any of our QuikFence posts. Neat item used to repair broken horizontals in electric netting. 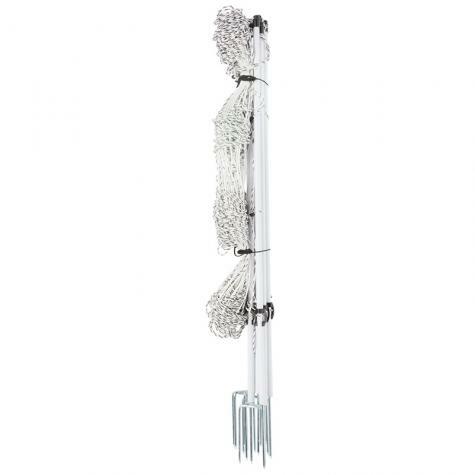 This clip is designed to connect all the horizontals on any electrified netting together electrically. Replaces lost, misplaced or broken plastic caps (for posts 0.75" in diameter) on netting posts. Holds top strand of net in place so there is less sagging. 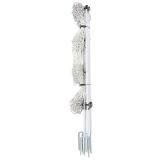 Number of reviews: 12 customers reviewed this product. Recommended: 12 out of 12 said they would recommend this product to a friend. One of our consultants who travels around with her horses for barrel races likes to take along a roll or two of this so her horses can have a small paddock attached to the back of their trailer. Very easy to set up and it has higher ohms of resistance (less charge flows through) to accommodate more spirited horses. Wonderful product! Easy to set up if you follow their directions. Here's a tip... to store this I found a ski bag was perfect! It fit the fence, and additional corner support posts. I also got the step in battery fence charger and that fit in the bag as well! I took my 2 horses on a 3 day camping trip. This fence worked incredibly well. It was easy to set up, tear down, and did not take up much room in the trailer. The horses had ample room to move around. Loved it! 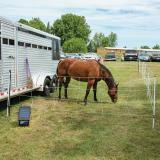 Used it camping at an endurance ride last weekend worked great,had to leave one horse in camp due to an injury, he cantered circles when his buddy left, but the fence held him.Shipping was also very fast. THis is a great product! 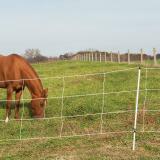 My children (ages 15 and 17) are, by themselves, able to move our horses to new grass every few days with this great fence! Also, Premier One has very fast shipping! --If you are methodical and follow a regular way of taking it down, keeping the top of the posts clear of the netting, it's possible to keep it from tangling. In general though, it's made my targeted grazing scheme work with ease. My pony respects the fence even when it is not electrified.